Happy New Year!! 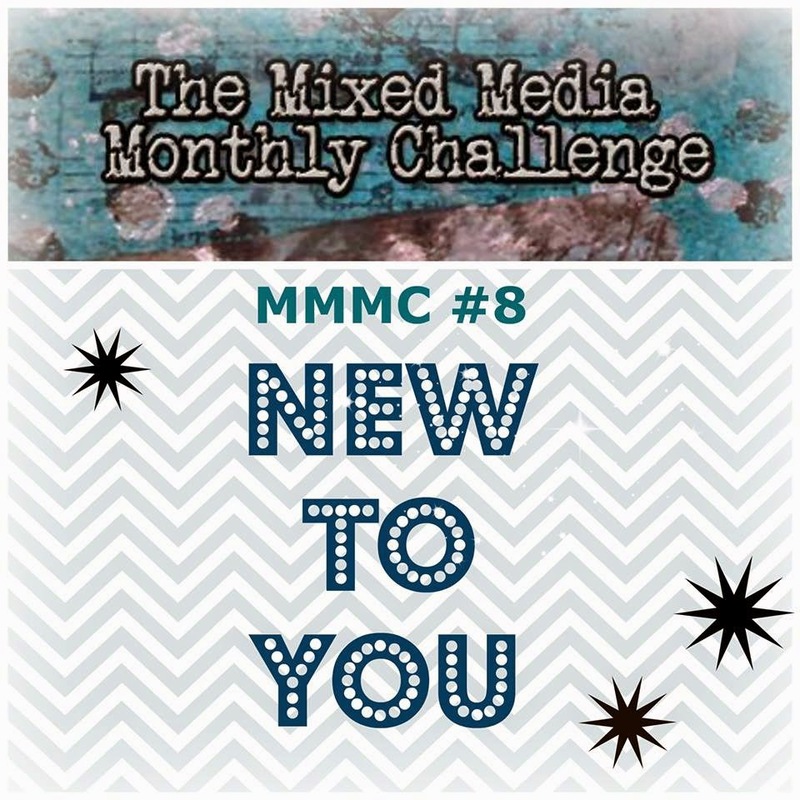 It's time for another challenge at the Mixed Media Monthly Challenge Blog. Our theme for this month is "Something New for the New Year." Just do something new in your project - use a new product, try a new technique, make a new kind of project etc...Just think outside of your normal box and go have fun making something!! Be sure to check out the blog to see all the inspirational projects created by the rest of the design team. Also, check out our new designer we are welcoming this month, Karen Crossen. You are going to love her work!!! Our sponsor this month is the new and awesome crafty online store Butterfly Reflections Ink. They have great prices and lots of fun mixed media items like the entire line of Dina Wakely Paints, Gesso, and Gel Medium. Also, check out their blog where you can see some gorgeous projects created with the products they sell made by some very talented designers. They are generously offering a $25 gift card for our lucky random winner. For my project I made a 6x6 canvas. I created the background using my new Pan Pastels. I ordered them over Thanksgiving and finally got a chance to use them. 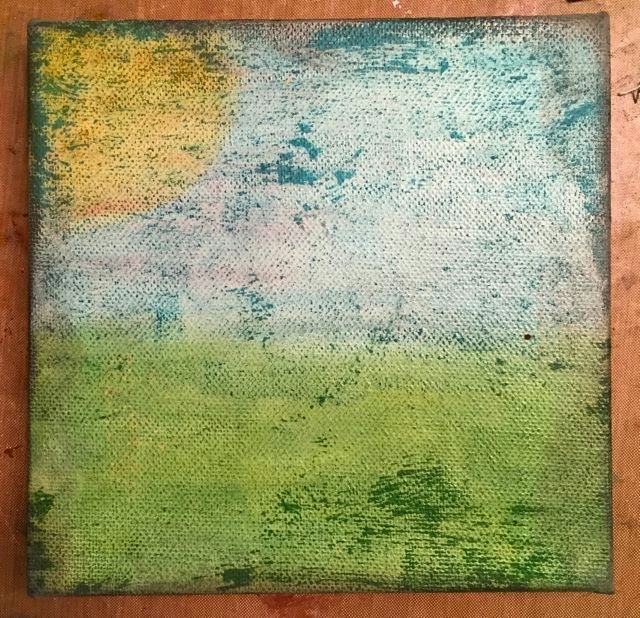 I tried to emboss on the canvas before adding the Pan Pastels, but I'm not a great embosser and all I have is the Ranger Heat Tool which is not good for heat embossing. Basically, most of the embossing ink didn't heat up even though I held the heat tool over for what seemed like forever. So, in the end, I just put on the Pan Pastels and they smeared some of the embossing ink that wasn't dry and it kind of made for an interesting background. I placed the clouds on the canvas a couple times to make sure the shape was good and the clouds fit within the tree branches. I adhered the burlap clouds with hot glue. I die cut the tree which is a Karen Burniston die from grunge paper. Then I put modeling pasted on the trunk and limbs to add some texture, painted it and highlighted it with a Stampers Big Brush pen. You can really see all the details in the picture. 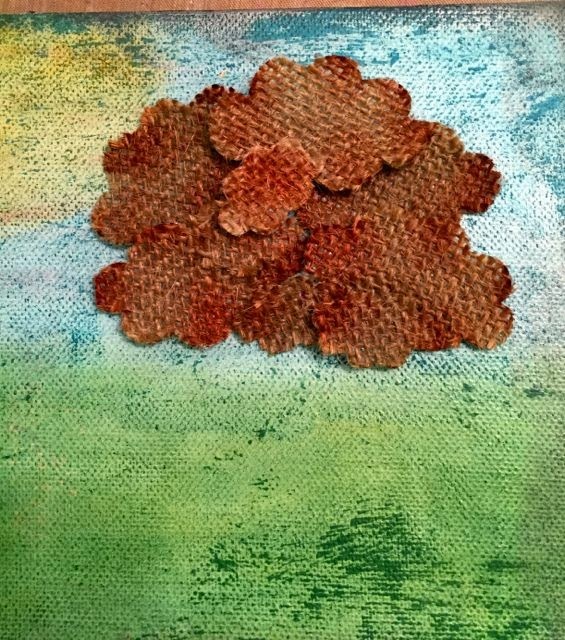 The die comes with some clouds so I die cut the clouds with burlap and colored the burlap with Pine Needles and Antique Linen and Bundled Sage Distress Stains. I used hot glue to adhere some Prima Marketing and My Minds Eye buttons to the tree. I also outlined and colored some of the buttons using different Stampers Big Brush Pens. To make the sun stand out more I colored it with some Stampers Big Brush Pens and I inked the edges of the canvas Ranger Archival Ink in Watering Can. 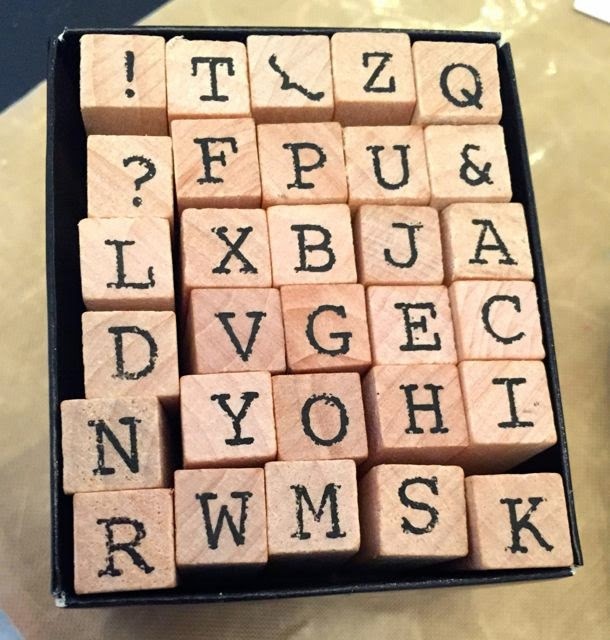 Finally, I got a set of little letter stamps at Hobby Lobby. They're so cute. I love how the words are not perfect when you stamp with the individual letters. I stamped lots of inspirational words on the bottom of the canvas with Black Staz On Ink. And here's the final product. I love using the Pan Pastels, they were really fun and easy to work with. And the Karen Burniston All Seasons Tree die was great and has TONS of possibilities. It also comes with leaf, snowflake, and flower dies so you can create a tree for any season. 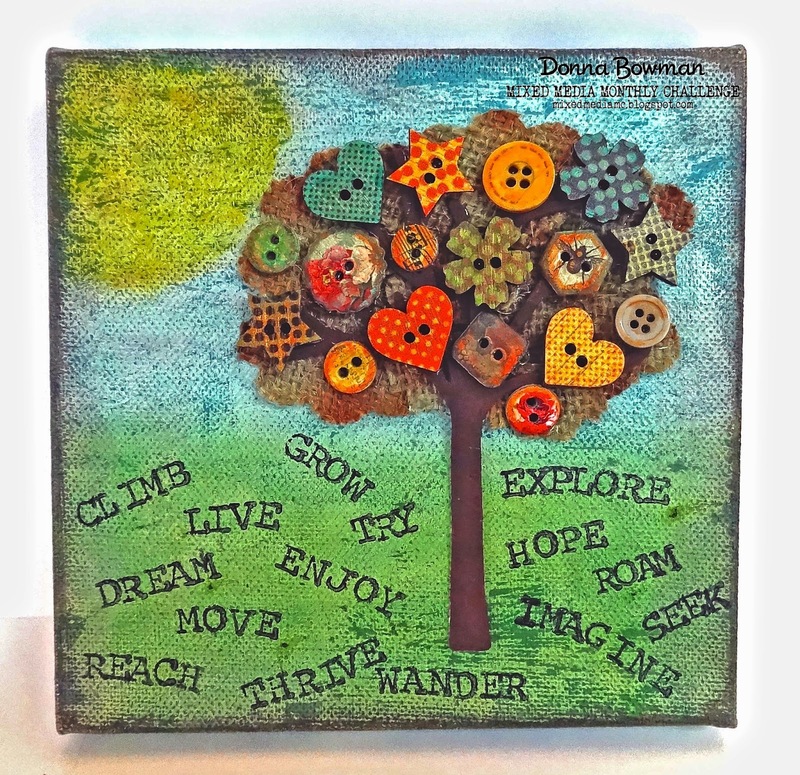 Love this canvas, Donna! Glad you had a chance to play with you new goodies. WOW Donna, You have rocked this! HNY GF! Ace project. Love the buttons.